The best computer data safety and security devices offered by The Connectivity Center take a systems approach, working together to provide enhanced defense against purposeful intrusions and unintentional network contamination. The Connectivity Center helps you think in terms of systems, when it comes to selecting the best computer data safety and security devices for your operation. HUNTSVILLE, AL, August 21, 2018 /24-7PressRelease/ -- The best computer data safety and security devices are the ones you need right now. For most of the world's enterprises and operations today, that takes in a whole lot. After all, cybersecurity is one of the hottest topics on the planet for good reason. The threat is relentless, the exposure is vast, and the stakes are high enough to be called existential. It's hard to imagine a business, service, or enterprise of any kind today that does not depend on secure data and the instantaneous exchange of information. The very existence of business, government, and communication requires a strong cybersecurity strategy, and with the stakes extremely high, it is mission critical that you have the best computer data safety and security devices deployed. In fact, the growing awareness of how vulnerable information and data systems are to hacking, contamination, and attack has led to an environment in which cybersecurity solutions are grasped-for with what looks like a degree of desperation. This hyper-sensitive environment led Forbes Magazine to predict in 2016 that spending on cybersecurity measures would top $170 billion by the year 2020. Based on developments since then, including the discovery of how cyber-attacks have been used to destabilize governments and influence elections, cybersecurity spending can only be expected to increase. The stakes are so high, and the threat is so vast that corporate behavior in the face of cybersecurity threats has taken some curious turns, some that reflect confusion. For example, Volume 7 of AT&T Cybersecurity Insights reported that 28% of companies responding to a study devote all or most of their cybersecurity investment to insurance, rather than prevention and protection. Even those companies that invest in cybersecurity measures appear to do so from a point of view that reflects, "Let's try everything." And many of those online cybersecurity measures that are deployed seem based on counterattack – responding to a cyber-attack after the attack is detected, rather than building a perimeter of prevention. The hint of desperation we detect in conventional responses to the cybersecurity threat is even more unfortunate when you consider that what should be the most obvious sector of the perimeter is usually left unguarded. Selecting the best computer data safety and security devices depends on recognizing that the physical threat to data and information security is at least as significant as the online threat. The data ports and connectors that unite computer systems and networks of every kind are all too often overlooked, as companies think exclusively in terms of online threats and software solutions. It is ironic that the non-physical space of electronic and microwave exchange is seen first. A real, practical response to the ongoing cybersecurity threat includes measures that thoroughly secure those data ports and connectors. That means that the best computer data safety and security devices for you to consider include devices that positively defeat efforts by unauthorized personnel to access ports and connectors. In many cases, the best computer data safety and security devices must also limit access even among trusted associates, because both research and real-world experience prove that casual contamination of data systems is at least as large a threat, or even larger, than the threat of intentional hacking or cyber-attack. Flash drives and smart phones are often the source of data system contamination. Even the most trusted associates seem unable to resist plugging-in at work, and in fact some of the most historically damaging cyber-attacks were deployed through seemingly innocent, "found" thumb drives. Strange and ironic, but true. The Connectivity Center helps you think in terms of systems, when it comes to selecting the best computer data safety and security devices for your operation. In stark contrast to the "try everything" landscape so painfully evident elsewhere, we think in terms of suites of solutions that respond to real experience and need. From the beginning, that has been our strength. 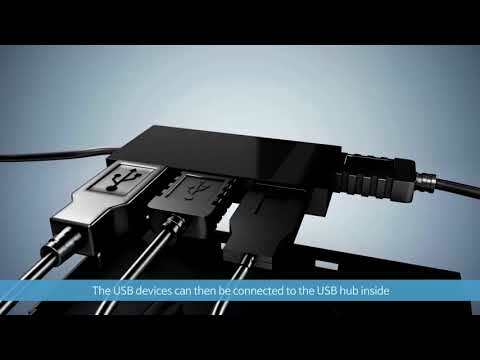 A simple, yet powerful example is the means we provide to make sure that only safe and authorized flash drives are connected to your USB ports. We offer the Smart Keeper Secure Kit, comprising two components that, working together, make sure your associates can access a USB data port only when authorized, and only with a secured memory device. It works like this. Inserting a Smart Keeper Secure Connector to the USB port, a red locking button is activated, which prevents its removal, except by an authorized possessor of the Smart Keeper Professional Port Lock Key. While the Smart Keeper Secure Connector is on the job, it will only accept an authorized Smart Keeper Secure Drive. Together, these components allow your system to accommodate the flexibility that the pace of work today demands, without the risk of casual contamination by associates or even an intentional attack by an unauthorized user.